All the candidates out there, are you interested in PSC Jobs? If yes, here at Chekrs you can relieve your search with the list of the PSC Vacancies 2019. The PSC (Public Service Commission) is usually the state level institutions that release PSC Job Notification at regular intervals. The work function of the department is to disseminate requirements and information of all the institutions working at the State level. 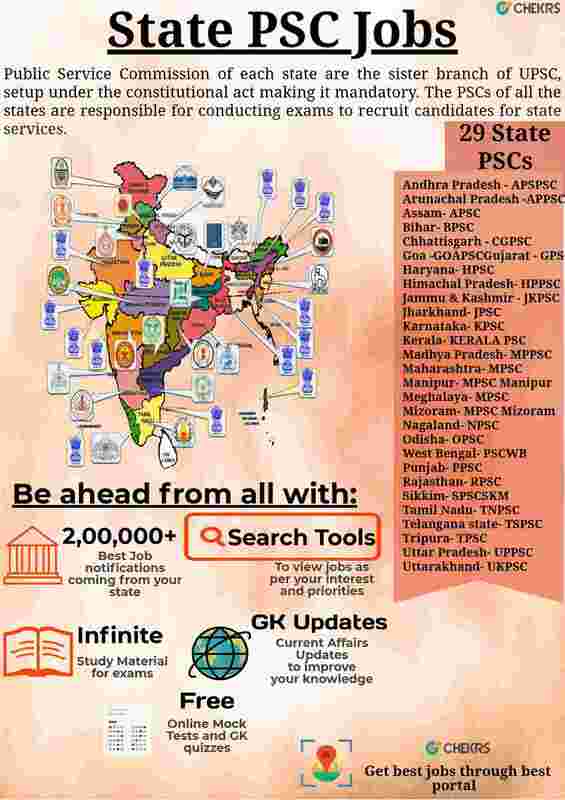 If you are also looking to get an opportunity to work in the State PSC Jobs 2019 then you are already at one stop for all your searches. Moreover, by taking subscription you can know at first any of the Latest PSC Jobs announced in your state. You can choose from PSC Jobs in UP, Kerala, Karnataka, MP, Punjab, Maharashtra, West Bengal and all other states. We make you feel privileged by eliminating your task to search the PSC Bharti 2019 as per your educational qualification and interest. While you are indulged in preparing yourself to get a decent PSC Sarkari Naukri, at Chekrs you can find out the lost of posts for which you are suitable. Through the easily searching tools of PSC Jobs for 12th Pass, Graduates, BTech, BCom, MBA, etc which includes your highest education level. Why Chekrs for Latest PSC Jobs? Once when you have found the one job you are determined to apply for. We provide you the study material through which you can make sure that you will be selected. You are free to download and use the sample papers, previous papers, online mock tests, and daily GK quiz.